Holding a college degree, it is widely assumed, improves the likelihood that a person will be successful in the labor market. This maxim draws individuals into college across the class spectrum and aspiring students who are low-income or non-white may find themselves enrolled at a for-profit college. For profit colleges have been getting slammed for their high prices, low bars, and atrocious graduation rates. Now we have another reason to worry that these institutions are doing more harm than good. Economist Rajeev Darolia and his colleagues sent out 8,914 fictitious resumes and waited to see if they received a response. They were interested in whether attending a for-profit college actually enhanced job opportunities, as ads for such schools claim, so they varied the level of education on the resumes and whether the applicant attended a for-profit or community college. Photo by Ryan McNight flickr creative commons. It turns out that employers evaluate applicants who attended two-year community colleges and those who attended for-profit colleges about equally. Community colleges, in other words, open just as many doors to possibility as for-profit ones. Darolia and his colleagues then tested whether employers displayed a preference for applicants who went to for-profit colleges versus applicants with no college at all. They didn’t. Employers treated people with high school diplomas and coursework at for-profit colleges equivalently. Being economists, they staidly conclude that enrolling in a for-profit college is a bad investment. H/t Gin and Tacos. Image borrowed from Salon.com. Cross-posted at Pacific Standard. In other words, you needed substantial experience on top of the degree from this institution to make up for the fact that the degree was from this institution. I'm confused. If "employers evaluate applicants who attended two-year community colleges and those who attended for-profit colleges about equally," and "Employers treated people with high school diplomas and coursework at for-profit colleges equivalently," doesn't that mean that employers treated people who attend community colleges equivalently to those who have only a high school diploma? If A=B and B=C, A=C. I clicked and read the study, and it says "estimates of the community college effect are consistently positive but not statistically significant." So why is the conclusion you are drawing for profit=waste of time and money? This study also shows that community colleges are ALSO a waste of time and money, as employers do not see them as any different from a high school diploma. I am not a fan of for-profit colleges, but this is a dishonest way to present this research. I am usually excited about alternatives to the traditional approach, especially those that focus on discrete skill sets and aim to educate adults, but this one seems to be heading south fast. I'm surprised actually that American entrepreneurs, who deliver quality and profits in the face of stiff competition in so many service-oriented businesses, have managed to muck this up so badly. 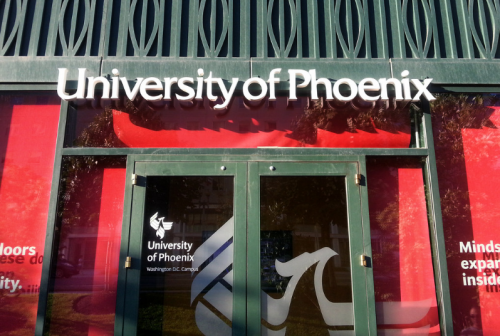 I have a close friend who has a degree in education (or something) from Phoenix Univ. She then used that to go to another institution of questionable reputation to get her masters. And now guess what? She teaches middle school math for a Georgia school district. And we wonder why our kids are doing so poorly in school. I used to be an agency recruiter and my clients would almost never choose to interview someone with a for-profit college on their resume. Early on I figured out to just discard these resumes. Now granted my clients were paying me 25-30% of the first year salary when hiring someone through me so they expected I'd find better candidates than they could find on their own. Even if someone had an undergraduate degree from a reputable university but got a masters from a for-profit, many employers would rather not even know they have a masters. The masters from the for-profit was actually a detractor rather than a positive addition. I don't think employers think someone can't get a good education from a for-profit college; but that someone that went to a for-profit school either has poor judgement for thinking that was a good investment or they must have not been smart enough to get into a better school. In many cases that isn't true but that's the perception of the educated public in hiring manager roles. All the For-Profit schools are a joke and a bunch of smoke and mirrors!!! I was enrolled in one and I was wondering why a teacher gave me a 92% when I didn't understand any of the questions and was late handing it so I guessed on the rest of the questions. So either I have great guessing skills or the teacher didn't even look at it and slapped a grade on it. So I did my recon mission. I handed in a Noodle Soup recipe as a math assignment. So I waited a few days for the teacher to grade it. To my amazement I got a 100% on the assignment. LMAO. It should be a 0%!!!! Its a noodle soup recipe!! Obviously nothing to do with the class or the assignment! It was a math class not a cooking class!! What a joke. So I wasted a 1 1/2 years at that place. Who knows if I did ANYTHING right in previous classes and previous assignments!! BIG SCAM!!! there are two gaps in the study. they do not account for the fact that only a small percentage thrive within a community college environment with a grad rate of only 19.8%, that it can take years to get an associates degree at a nfp school which takes a person out of the job market. in addition, the study does not take into account the timing. proprietary grads do well when they go to school in a recession. this was the 'great recession'. the job graph shows as an L vs the usual V or even U. 15 million jobs permanently left with this recession. Everyone has trouble getting a job. Skewed research slays me.